ACTION ALERT: "Emergency” rules proposed for Mauna Kea could authorize DLNR to severely restrict public access to the mauna and impose severe penalties for violations. 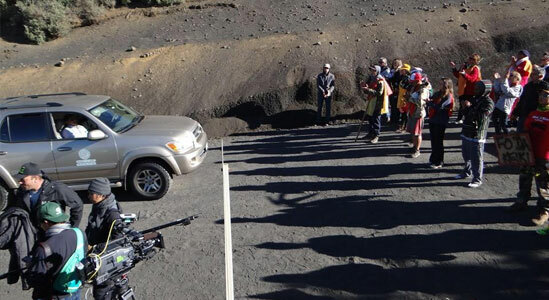 Testify against proposed "emergency” rules for Mauna Kea. First, there is no emergency - no one has placed natural resources in "imminent peril.” Second, but more importantly, the "emergency rules” are pretextual. Their aim is rather to stifle legitimate, political speech to protect Mauna Kea against the Thirty-Meter Telescope (TMT). WHO: We need to tell the Board of Land and Natural Resources (BLNR) NOT to approve "emergency” rules for Mauna Kea. WHAT: "Emergency” rules proposed for Mauna Kea could authorize DLNR to severely restrict public access to the mauna and impose severe penalties for violations. These emergency rules are separate from the Office of Mauna Kea Management’s rules, which they held "open houses” on in late June 2015. WHEN: July 10, 2015, 1:00PM (or later). Testimony signups from 8:45am-1:00pm. WHY! To support the Kū Kia‘i Mauna, constitutional rights to assembly and political free speech, Hawaiian cultural practitioners in their vital practices, and public access, recreation, and enjoyment of the pristine environs of Mauna Kea. Hawaii Administrative Rule (HAR) §13-123-21.2 Prohibited activities. (b) No person shall at any time bring in to the restricted area or possess or control in the restricted area any of the following items: backpack, tents, blankets, tarpaulins, or other obvious camping paraphernalia. (c) No person shall enter or remain in the restricted area during the hours of 8:00 p.m. to 5:00 a.m., except to the extent the person is transiting through the restricted area in a motor vehicle on the Mauna Kea Observatory Access Road. The Access Road is 14 miles long, which means 28 square miles or 18,000 acres will be "restricted areas.” No one will be able to "camp” or even have a backpack in this 18,000 acre area. This area would cover 13,500 football fields. Most troubling are the enforceable penalties for violating this emergency rule, which include: $2,500 civil fine (first offense) to $10,000 civil fine (third offense) (HRS §171-6.4), petty misdemeanor criminal liability (HRS §171-31.6), minimum $500 criminal fine (first offense) to $2,000 (third offense within 5 years) (HRS §171-31.6), up to 30 days jail (HRS §171-31.6), asset forfeiture of cars, etc. used in violation of the prohibitions (HAR §13-123-22 and HRS §171-31.5), and the loss of your hunting license. We need to press BLNR to scrutinize the necessity of proposed rules and to assess the real impacts of these rules and the procedures through which these "emergency rules” gained traction. What evidence does DLNR have of "imminent peril” consequent to encampments near roads to Mauna Kea? Kū Kia‘i Mauna camps have remained by Hale Pōkahu, far from sensitive summit environments - how is their presence more of a threat than the 300,000 visitors and over 32,000 vehicles every year (i.e. over 270 people per day)? Kū Kia‘i Mauna have provided their own portable sanitation facilities, trashbags, and transported their waste away from the Mauna. How can DLNR justify a need for "emergency” rules when there is a long history of actual natural resource threats and concerns from the lack of management and enforcement in the summit area that continue to remain unaddressed? The state’s attempts to limit Kānaka Maoli rights to care for (un)ceded lands or to observe cultural practices in a sacred space violate the spirit of the 1993 Apology Resolution and rights guaranteed to Native Hawaiians under article XII, section 7 of the Hawai’i constitution. Protecting Mauna Kea and holding it in reverence as a sacred, spiritual realm are traditional and customary practices that are constitutionally protected. Would prohibiting and penalizing any activity near the Access Way prevent peril to "natural resources”? DLNR failed to identify the "peril” to natural resources that initiated their proposed emergency rule. The Kū Kia‘i Mauna have been an excellent conduit for the many and varied political and spiritual protective energies that have been brought to the mauna. How would forcibly removing this peaceful, organized force ensure the protection of public safety and natural resources? DLNR lacks documentation of imminent and serious threats to public safety and natural resources consequent to "camping” alongside the summit access road. "Campers” have rather sought to exercise significant constitutional and due process rights relating to the First Amendment and the right to assembly. DLNR’s proposed arbitrary declaration of "public safety” is a thin and illegal veil for its primary purpose in dispersing people working to protect a place sacred to Kanaka Maoli, in accordance with HRS 711-1107 on desecration and U.S. Public Law 95-341, the American Indian Religious Freedom Act, which includes Native Hawaiians. DLNR’s submittal did not explain how existing laws were not sufficient to address the alleged threats to public safety or natural resources. We submit testimony on Item C.2 on the BLNR agenda, at least by Thursday 7/9 at 9am (needs to be 24 hours in advance). You can email DLNR administrator Ku`ulei Moses at: kuulei.n.moses@hawaii.gov. And we show up at the Honolulu BLNR meeting as early as 1:00 PM (or earlier if you want to sign up for public testimony). See you there! Do NOT approve "emergency” rules for Mauna Kea. Ok - seems like Item C.1. has a rule allowing the BLNR chair to "close public hunting areas for 6 months", which would accomplish what the "emergency rules" do under Item C.2. See page 4, 6, and 8 relating to HAR 13-122-11.9 and 13-123-21.1 (relating to the temporary closure of public hunting areas). So, you may want to oppose both Items. Sheesh. I do NOT approve of emergency rules for Mauna Kea. The reasoning does not fit the criteria of a emergency rule change. People have the right to have their voices heard w/o these ridiculous tactics. Think before you act. The resources are definitely in perilous danger at the hands of Governor Ige, DLNR, BLNR,OMKM and TMT save the mountain it belongs to the people of Hawaii and the rest of the world. Not to be destroyed for a small select group of people. This whole process and drama in an effort to streamline their personal agendas while slandering non violent lovers of the land to punish them or restrict them is to deny the earth of the people who are trying to take care of it. The Mountain should be preserved forever. LEAVE MAUNA A WĀKEA ALONE ALREADY! ENOUGH HARM HAS BEEN DONE ALREADY! This so called emergency is a flimsy excuse if ever there was one! Declaring this an emergency is tantamount to being ordered not to lick an envelope, as you might cut your tongue and bleed to death! Get real, you know all you want is to have that MONEYMAKER built! I've seen what the TMT corporate heads make and it's nothing short of obscene. DLNR is supposrd to protect Hawai'i from the corporations, not protect the corporations from us! Buzz-words about 'safety' is only a political ploy to benefit the ones behind TMT... and to punish the kanaka for defending their rights. The 2015 Hawaii Committee of Safety (HCS), like the 1893 Hawaii Committee of Safety, is using the phony claim of “Public safety” and the “threat of imminent harm” to rationalize its unjust, and blatantly, illegal actions. The HCS already blocked summit road access, shut off water and closed restroom to residents and visitors at the Mauna Kea Visitors Center in an attempt to force an end to protectors of Mauna Kea from continuing their 100 plus day vigil near the visitor center. The HCS also removed portable restrooms bought in by Mauna Kea protectors for sanitary use by visitors and protectors after the Visitor’s center restrooms were locked. Now, the HCS wants to create further civil and human rights violations and restrictions in the phony interest of “an imminent peril to the public health, safety,…” Such proposed rules would further restrict public access to Mauna Kea and impose penalties for violations. The proposed area for restricting constitutional rights to free speech and assembly, Hawaiian traditional and customary rights, as well as public access and recreation amounts to 28 square miles, or 18,000 acres. The area covered by this emergency rule is described as any lands within one mile of the Mauna Kea Observatory Access Road. Please don’t let this happen. Act to affirm rights to free speech and assembly, rights of native Hawaiian cultural and traditional practices, including spiritual practices on Mauna Kea. Ige needs to put ALL the Lua back...he is in direct violation of the right of handicapped consumers & even a governor does NOT want to be approached by a Consumer Advocate on this matter. He is also in violation of peoples 1st & 14th Amendment Rights...NOBODY OUT THERE CAN SAY JACK!!!!! NOT THE PAID TROLLS OR ANYBODY ELSE!!!!!!!!!!!!!! Fear, desperation and greed. This is what I see when I read these rules. Honest men fear no truths being told. TMT and its supporters are cowards and therefor, lyers. Anybody can plainly see that the only imminent danger to public health and safety is the thirty meter monstrosity. For every action there is an equal and opposite reaction. To build you must first destroy, if so don't build. A hit & run was committed on the Mauna by TMT security...yet the Kia`i are treated as criminals!!!! The innocent suffer while guilty go free!!!!! Consumers suffer because DLNR wants to punish Hawaiian's for being right!!! !